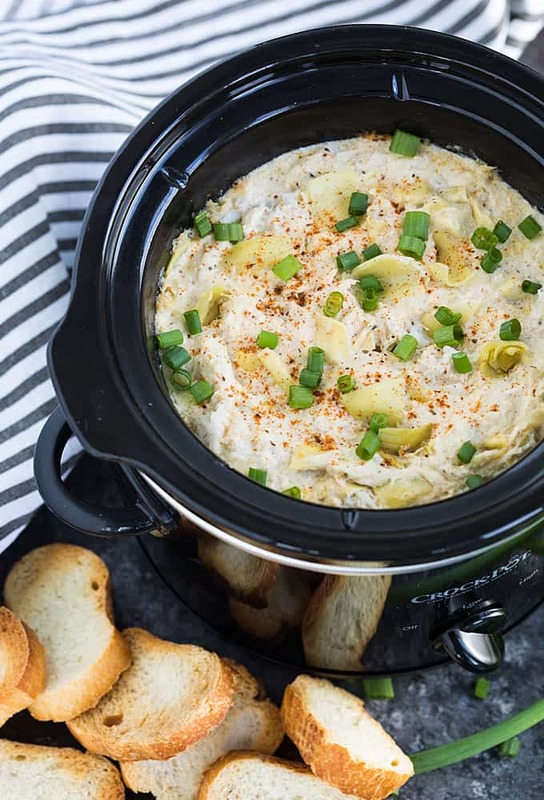 Holiday celebrations are in full effect right now, so today I’m sharing one of my favorite party appetizers: Slow Cooker Crab and Artichoke Dip. Yesssss! 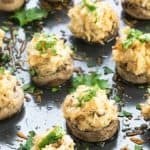 I love slow cooker appetizers because they free up your stove AND are easily kept warm throughout the party. A win-win situation! 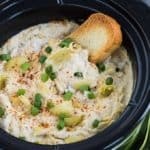 I have 3 slow cookers and I used a 2-quart slow cooker for this recipe. 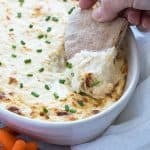 This recipe yields about 6-1/2 cups of crab dip, enough for about 13 people if each person gets around 1/2 cup each (sorry, I love crab dip and tend to over-indulge!). 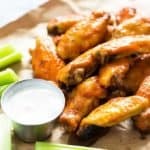 The reason I used a smaller slow cooker is because I’ve read that your slow cooker needs to be approximately 1/2 to 2/3 full to evenly heat and cook. 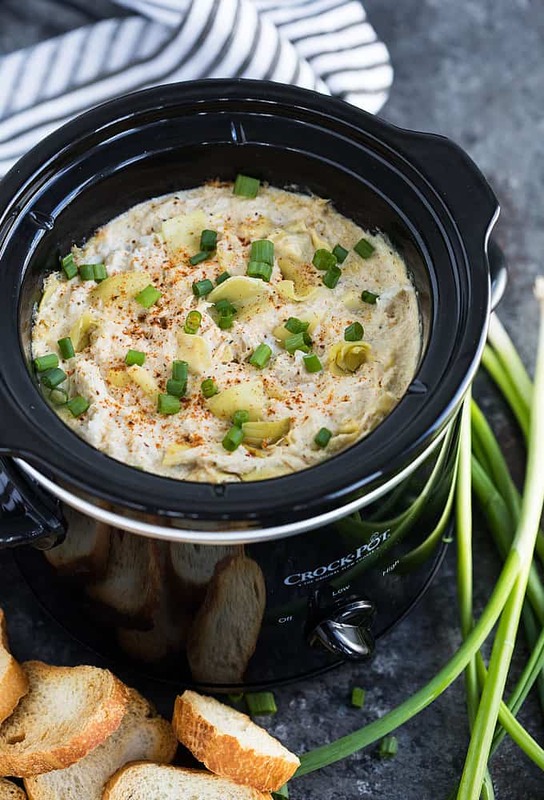 If you use a larger slow cooker, this recipe will take less time. 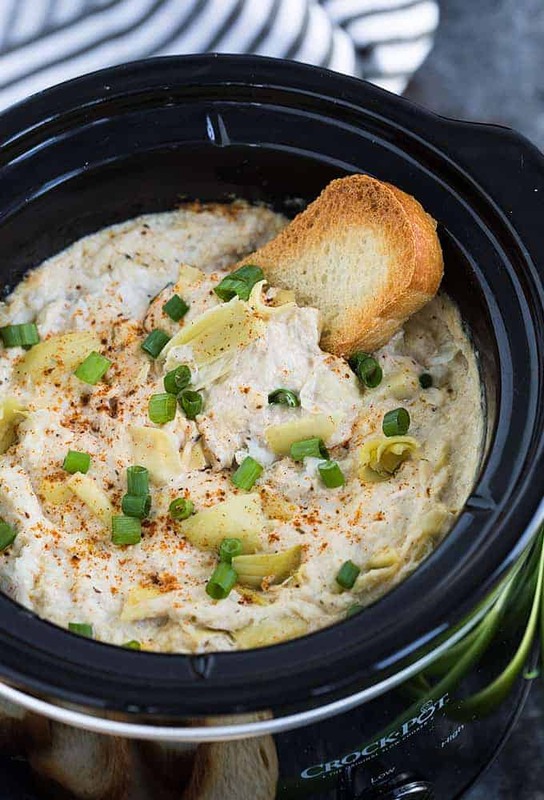 In a 2-quart slow cooker, stir together all ingredients (except green onions) until combined. Cover and cook on low heat for 2-1/2 hours, or until bubbly and heated through. Sprinkle with additional Old Bay Seasoning and sliced green onions. 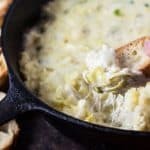 Serve with toasted baguette slices or crackers. 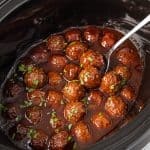 I love that you did this in a slow cooker! Perfect for taking to a work party or potluck. Looks fabulous! 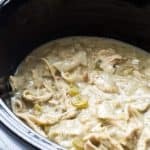 I’ve never tried making it in the slow cooker before! Looks so easy and delicious. Thank you so much for sharing – can’t wait to make this at home.